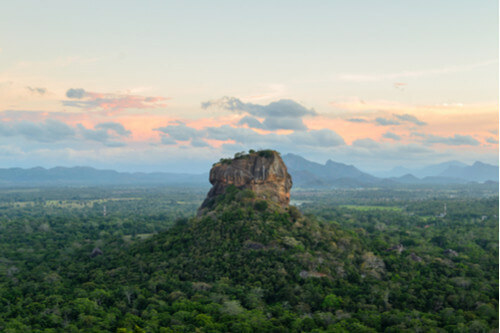 Just a few hours from Wasgamuwa, lies an ancient fortress considered one of the most unmissable sights in all of Sri Lanka. 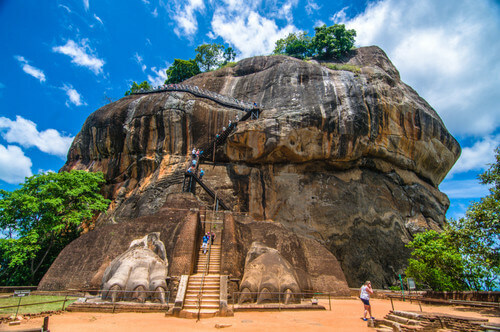 Sigiriya Rock Fortress (also known as Lion’s Rock) is a citadel carved into the top of a magma plateau from an extinct volcano. Inscriptions inside the caves connected to the fortress allude to it being a place of refuge for Buddhist monks as long ago as the 3rd century BC, however it remained relatively insignificant until the 5th-century AD. Under the order of King Kasyapa, the site was expanded and fortified. It’s believed that he chose this spot for his royal headquarters because he was worried about the kingdom being attacked by his brother, Moggallana, who he exiled to India so he could take the throne. The rock itself towers 200 metres higher than its jungle surrounds and is fittingly grandiose for a royal court. 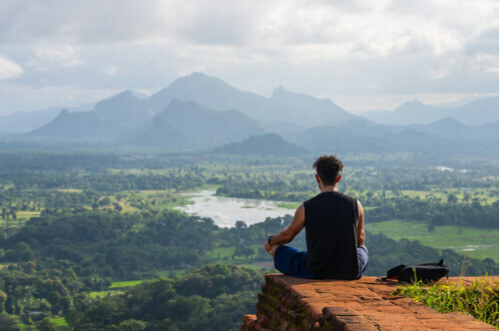 Centuries ago, Sigiriya was even painted white and made to look like a cloud floating above the trees, creating a unique illusion for visitors and subjects alike. Its walls were once plastered in stunning frescoes of women adorned in jewellery, some of which still remain in various parts of the ruined palace. Upon arrival, follow the red clay path towards the enormous rock looming over the horizon. The closer you get, the more detail become clear - marbled colours swirl within the rock and provide an interesting contrast to the green forest it’s encircled by. The walk is a great way to get the blood pumping - there are 1200 steps to tackle until you reach the top. On your way up, keep your eyes peeled for murals and sculptures. While most were washed away when buddhists transformed the site back into a monastery after Kasyapa’s death, some were just too hard to reach and thus have stood the test of time. Eventually, you’ll reach the impressive Lion’s Gate that guarded the entrance to the inner section of the city. Today, all that hints to its imposing former size are its enormous front paws. Just a few more stairs and you’ll reach the Sky Palace. 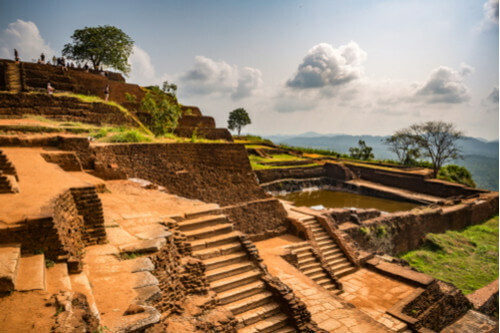 During the reign of King Kasyapa, the top of Sigiriya was etched with terraces, water gardens and an elaborate palace. Wander the remains of these constructions and enjoy sweeping views of lush Sri Lankan jungle as many would have 1600 years ago. 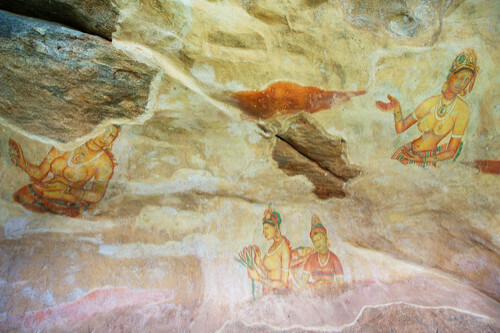 Sigiriya is one of those confoundingly elaborate ancient constructions that baffles comprehension. Like the pyramids or Machu Picchu, there are theories as to its construction, but no one knows for sure how it was built or how materials were transported. All you can do is take in the unobstructed landscape and let the stunning sight settle into your memory.